Statistics don’t lie: communal living seems to help people be happier. At the RareBirds Housing Co-operative, community life and outside activism deepen and strengthen each other. How can we do right by the native peoples whose ancestral homelands now host our intentional communities? 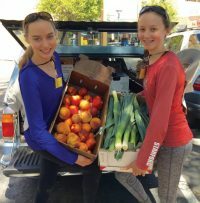 Growing up in a community with a strong commitment to changing the world can be both enlivening and challenging. At Black Bulga, the experience of community provides vital support for members to be effective change agents in the wider world. In a decades-long project with worldwide reach, medicine, humor, and community become vehicles for social change. Adults with disabilities and residential caregiver volunteers share the challenges and joys of community life at Innisfree. 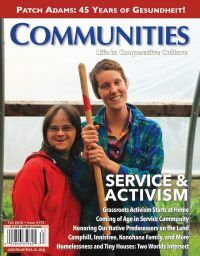 Our Fall issue explores Service and Activism in intentional communities. Authors share their stories of living and working in both service- and activist-oriented groups, including Camphill communities, Innisfree Village, Gesundheit!, Konohana Family, Magic, Black Bulga, and more. How do service and activism build community, both within a group and in the larger world? 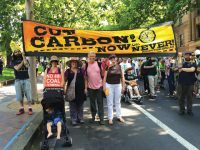 How can communitarians contribute to the well-being of the planet and its people? We also explore how long-standing, mission-focused communities—including Harbin Hot Springs, ZEGG, and EcoVillage at Ithaca—have evolved over time, and the latest research about happiness in community.